The city of Langley has seen significant growth in the last several years. As the city gets wider, it also gets higher with multi-unit properties going up all over. You can’t have multiple living spaces without a proper laundry room. Keeping a functional system means more than appliance maintenance but includes regular Langley dryer vent cleaning as well. Keeping ventilation systems up and running means high-functioning machines, and happy tenants – so what is not to love? Regular maintenance practices are not optional, but they are difficult. Your dryer might come equipped with a screen to block lint and debris but these lint traps are not enough to prevent 100% of material from making it into vents. Over time, these bits that sneak through collect along the inside of ducts and vents. As airways become less and less passable, machines stop working properly and the door is opened to health risks as well. Without proper ventilation, major health concerns like carbon monoxide backup and allergens become a reality. Fire hazards are always a concern where heat and flammable materials are involved. 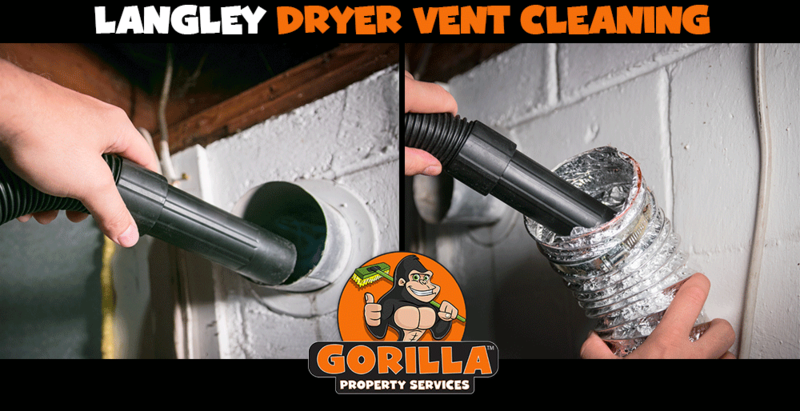 Let a Gorilla help minimize your risk while improving functionality with our Langley dryer vent cleaning service. One of the main reasons that dryer vent cleaning is so often neglected, is that getting proper results is tough! Without the right tools for the job, it can feel impossible to even get a view of your dryer vents. Simply clearing away the reachable areas is not enough to get worthwhile results. Inefficient appliances are a big enough pain on their own, but when there are other people depending on them, they can’t remain that way for long. The good news is that there are Gorillas all over the Langley area, ready and waiting to swing into action for your Langley dryer vent cleaning. Prompt service and expert results are what set our Gorillas apart from the competition. By combining specialized tools and top of the line training, there is no dryer vent that our Gorillas can’t have looking as good as new.